Everyone agrees that Emotional Intelligence (EI) plays a key role in overall success. But when it comes to putting theory into practice. ... The more than 100 cutting-edge tools and strategies presented here are used by the most effective leaders in the world. 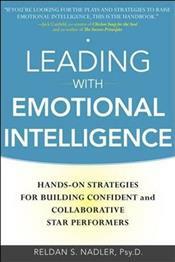 This complete, hands-on action plan has worksheets, exercises, self-quizzes, and much more to show how great leaders put Emotional Intelligence to work. ... First introduced 15 years ago, Emotional Intelligence (EI) has been recognized as a far better indicator of success in the workplace than IQ is. But how do you apply the principles of EI in the real world? This book shows you how. ... Filled with more than 100 EI tools and techniques, Dr. Nadler's proven program is a must-have resource for CEOs, executives, managers, and team leaders. Organized by key topics--communication, collaboration, confidence, self-control, and developing others--this book offers invaluable quick-reference tips, as well as detailed checklists, worksheets, and action plans. In addition, you'll find fascinating frontline reports of leadership in action: Warren Buffett's vision and leadership of powerful CEOs, Jeff Immelt's staying power at GE, Pete Carroll's optimism at USC, and Meg Whitman's commitment to service at eBay. This is how successful people put their emotional skills to work. This is how you increase confidence, teamwork, and performance. This is Leading with Emotional Intelligence.